Next Time that you are walking down the street or sitting in your backyard and see a bat flying by, you might want to consider thanking them. Sure, its a bat and it’s not like it can understand you, we are just being figurative. Bats are a huge form of natural pest control here in the Sacramento area, as they fly around a night eating bugs. You may have noticed that in recent years, Northern California has had a huge increase in Mexican free-tailed bats, and some people saw that as a bad thing. People have always seemed to villainize bats because, well let’s face it, they’re pretty scary looking. We get it, bats are a little scary and they make you think of vampires, but at Earthwise Pest Management we love bats! Bats have a lot in common with our pest exterminators, because both bats and our exterminators spend the greater part of their day getting rid of bugs. Bats are mother nature’s pest control, eating bugs that could have potentially gotten into your business or home. You may not notice the number of bugs that they eat but you sure would notice if they stopped eating bugs, as clouds of insects like mosquitoes would block out the sun. Okay, that was a little drastic, but large Mexican free-tailed bat colonies can eat up to 250 tons of insects in a single night. Can you imagine what 250 tons of insects even looks like? We can’t, and we don’t want to. While it’s unlikely that you could find a large colony of bats anywhere near your Roseville home, it is more than likely that there is a small population in your area. They key to enlisting bats in your war against mosquitoes is as simple as making your yard a desirable place for bats to live. Making your yard an inviting habitat to bats can help you control mosquitoes and moths in your yard. If a bat is living in close proximity to your house, it will most likely feed near your house, it’s almost like both you and the bat win! The best way to create an inviting environment for bats is to build a bat house. By building a bat house you are providing the bats with a desirable place to live, and that is the key to keeping them around. Another way to coax bats to be your in-yard exterminator is to leave out water for them, after all, they might get thirsty after eating all those bugs for you. We understand, it seems a little odd to want bats in your yard, but they are great at pest removal, just like we are at Earthwise Pest Management. You can always tell when something is working when you look at the reviews. While the bats don’t have countless positive reviews like we do, they do have the cold hard numbers on their side, and the numbers don’t lie. A Mexican Free-tailed bat can eat up to 1,000 small insects a night. That’s 1,000 fewer insects that can get in your house now. Aren’t you glad you invited the bats to your yard? 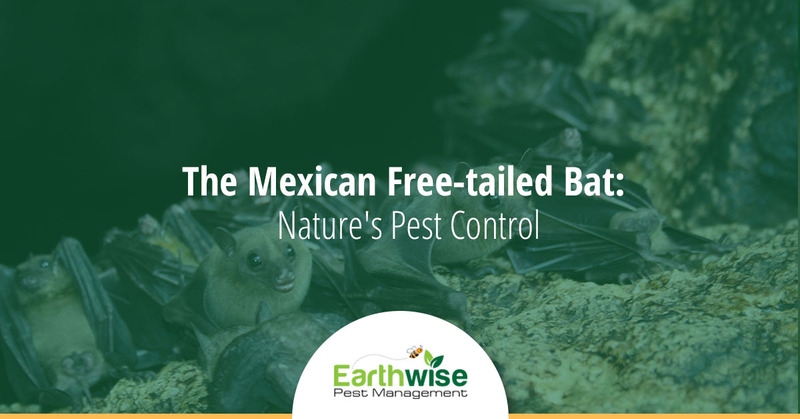 At Earthwise Pest Management, we understand that bats can’ solve all of your pest control problems, but they sure can help a little. When you need more help with pest removal, or if the bats are slacking off, call us for the best pest control experience that you will ever receive. Thanks for tuning in to our blog. We hope you learned that bats aren’t all as bad as you thought they were. If you have any questions about our pest control services or our pest control service prices, please contact us.